The Family of the Year award is a Campbell tradition that acknowledges the important role families play in students’ education. Students are invited to nominate their families at the beginning of each academic year by submitting an essay describing their family’s involvement at Campbell. 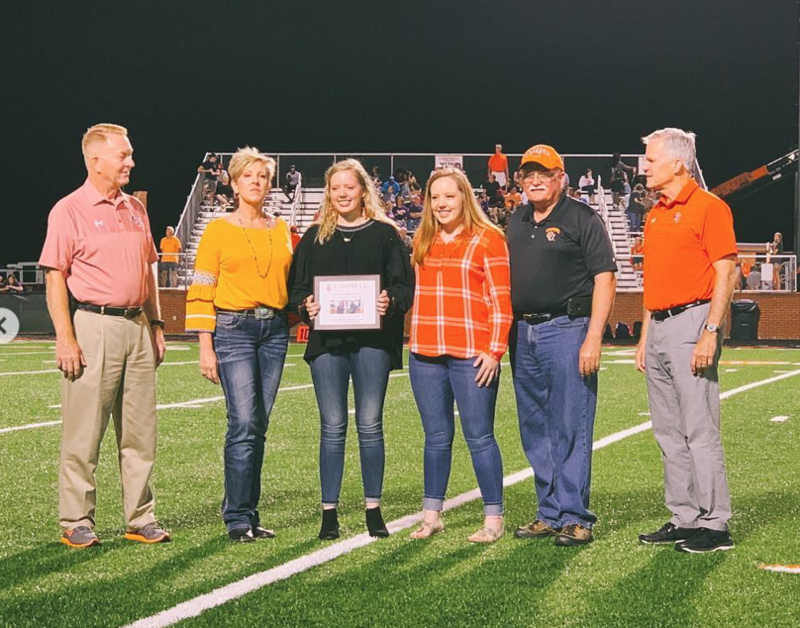 This year, Savannah Gaskins (’22) took the prize with her imaginative retelling of how her father, Eugene, uncle, Steve, and sister, Summer paved the way for her to attend Campbell. The family was honored at halftime at Saturday’s football game. Read Savannah’s winning essay below. My family’s Campbell University story is a tale as old as time. It is so magical, enchanting, and charming, it’s more like a fairytale than a fable. From here out, let’s call it Campbell-ella. Once upon a time in a land far far away called Bladenboro, Eugene Gaskins, the King of the Gaskins kingdom, made the decision to attend Campbell University. Majoring in sociology with the intention of becoming a police officer, he completed his four years of education and graduated in 1978. He then served at the Raleigh Police Department as a Captain for thirty years in an effort to support his kingdom. Little did this King and mighty protector know, that he had sowed a seed at Campbell, beginning a legacy that would run deeper than Buies Creek itself. This legacy began with a King and is continued by his two little Princesses. 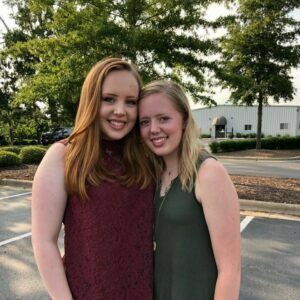 Sisters Savannah and Summer Gaskins. Almost forty years later, Summer Gaskins, Princess Number One and Math Wizard, accepted her royal destiny and embarked on her own Campbell adventure as an Accounting Major. She never applied to or even considered another University; Buies Creek water coursed through her veins. Being a picture-perfect princess with her ivory completion, auburn locks, and color coordinated outfits, Princess Summer walks the campus with the same beauty and grace as King Gene while completing her education. Sadly, her fairytale college experience will soon be over as she is set to graduate in December. Following closely in Summer’s footsteps, is me, Savannah Gaskins. I am Princess Number Two, a Fitness Fairy, and a Freshman Kinesiology Major. Although I consider myself as less of a frilly-dress wearing Princess and more of a horseback riding, knight jousting, dragon slaying warrior, I am still my Daddy’s little princess. Like Princess Summer, I recognized my royal birthright as a Campbell Camel and never applied to another school. Campbell University is in my blood. As I continue to embark on my epic Campbell journey, I have the support system of a lifetime. Each and every royal family member cheers for me in their own special way. The King is eager for his little Princess to finally get to walk the same brick sidewalks that he did and to watch his legacy continue to unfold. He looks forward to visiting campus, as he continues to watch it grow and expand into the beautiful brick oasis is it today. The Queen, who never had a proper university experience, delights in the sporting event opportunities for her little Princess. The Queen never misses a football or basketball game and talks about Jack Ryan and Chris Clemmons like she knows them personally. She memorizes the Camel Crazy cheers and always wears orange on Wednesday, even when home alone in the Gaskins Castle. Princess Summer is delighted to be able to mentor her “baby camel.” She looks forward to dorm room sleepovers and for Princess Number Two to finally get her own overabundance of free Campbell t-shirts. Knight Steve Gaskins, King Gene’s brother and 1980 Campbell graduate, also supports my journey from his own kingdom in Wilmington. As a Distinguished Alumnus and member of the Presidential Board of Advisors, Knight Steve provides both lofty aspirations as an Alumni and constant encouragement for an undergrad. This love and support came in handy as opportunities like the James A. Campbell Scholarship Competition and application for the Honors Program came my way. Sustained by King Gene, Queen Taylor (a Wake-Tech Graduate but Campbell Camel at heart), Princess Summer, Knight Steve, and a plethora of royal followers, I confidentially rode into battle and slayed the competition. I successfully secured a seat in the Honors Program and the $40,000 Gladys Baars Scholarship. I could have never done such things without countless hours of help from my royal family. Pep-talks from King Gene, stress relieving dance breaks with Queen Taylor, business attire outfit advice from Princess Summer, and inspiring text messages from Knight Steve all gave me the determination and resolve to ride into battle again and again. However, the most important support my royal kingdom provided for me was spiritual. Although my dad may be the King of our Castle, Jesus Christ is the King of my heart. My family reminded me of that and helped me to rest on His promise, not my own understanding as I made decisions regarding my college experience. The Gaskins Kingdom held firm on its foundation rooted in Christ, constantly ready to lift me to new heights or catch me if I fall. I now look to return the favor. My King, Queen, Princess, and Knight deserve the highest decoration of honor. First they watched Campbell rise brick by brick, into the educational and spiritual fortress it is today. Now, they watch me rise brick by brick, not into a princess or a queen, but into a Fighting Camel.